The parents of a student who died four days after starting university have accused the GP she saw prior to her death of "lying" at her inquest. Abigail Hall died aged 18 at Sheffield Hallam University's Trigon halls on 23 September 2015. Her parents had taken her to an NHS walk-in clinic the day before, after she had been ill for several days. GP Thomas Pollack told the inquest he "did not hear" Ms Hall describe her vomit as "coffee-coloured granules". She had suffered sickness and stomach pain for several days, the inquest heard. Ms Hall's parents, Mark and Charlotte Hall, insisted in court their daughter had described her vomit as "coffee-coloured granules" during the appointment on 22 September. Medics say the phrase indicates internal bleeding and is taken seriously. 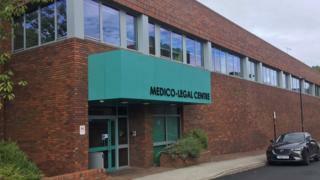 Dr Pollack, a retired GP who qualified in the 1970s and was working as a locum at the walk-in centre at the time, told Sheffield Medico-Legal Centre if he had heard Ms Hall say that, she would have been admitted to hospital. The doctor also said he was "notoriously deaf" and if Ms Hall had used the phrase, he may have "missed it". Mr Hall said: "I personally think you are lying [about the coffee-coloured granules description]." Dr Pollack replied: "I am a doctor and a former Army officer. I do not lie." The GP said he asked Ms Hall, from Doncaster, about her vomit as was usual clinical procedure, and took her pulse and blood pressure - which her parents deny. He said he had no reason for serious concern and prescribed anti-spasmodic drug Buscopan. Ms Hall's flatmates found her unresponsive in her bathroom the following evening and despite CPR, she was pronounced dead. Dr Pollack said the case had upset him "enormously" and he thought Ms Hall was a "bright young girl". South Yorkshire Police said the GP had been questioned under caution about the "coffee-coloured" description, but the CPS decided the matter should be discontinued. The inquest heard previously that a post-mortem examination found Ms Hall died of aspiration pneumonitis, caused when foreign bodies enter the lungs. Police said bottles were tested and CCTV taken from O2 and Tank nightclubs where Ms Hall went before she became ill.
All tests were negative and there was no evidence of drugs in the post-mortem toxicology report, the court heard.